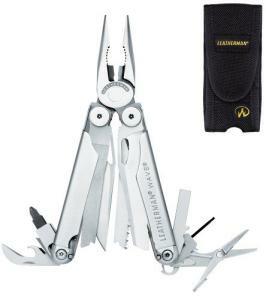 Leatherman, of course, makes great quality multi-tools, and the original Wave was one of their most popular. The New Wave updates the Wave to make it even better so it's bound to be a hit. The New Wave features a redesigned, stronger pliers that was one of the Wave's weaknesses. It also features locking tools and an optional multi-bit accessory kit that is a much-needed addition. What they didn't change was the set of tools -- it features four blades that can be accessed without opening the tool. These are two knives, a saw and a file. The interior tools are a scissors, two pliers, two wire cutters, another file, several screwdrivers, a bottle and can opener, a wire stripper and a ruler. Also included is a nylon sheath. This is one of Leatherman's full-sized tools so if you're looking for something extremely compact, this might not be your choice. And if you're looking for A Flock of Seagulls or some such other "New Wave" nonsense, look elsewhere.